How is this a stereotypical homeschooler thing? Well, all my homeschool friends write and kids that go to school always give me that "Aaah! It's because you're a HOMESCHOOLER" when I tell them I love writing. Yeah, I know that there are school-kids that love to read, but, c'mon, you put in "Stereotypical homeschooler" and you get "loves to read"
In less than a month :P I haven't met a school-kid that has read all of them. OKAY. GIVEN. I JUST READ THEM. But at music camp I asked my friends there if they had read them and they were like, "Nooo...." I EVEN HAD A HOMESCHOOL FRIEND TELL ME THAT I WAS BREAKING A HOMESCHOOL STEREOTYPE BY NOT READING THEM. Who would spend all that time watching all of the LotR extended movies except a homeschooler who has read all the book (and then give out snarky comments and cry at all the right parts)? So I know that not all homeschoolers are Christian's, but a good part peoples. My violin teacher was homeschooled, her mom teaches my siblings, and like half of her students are homeschooled. We listen to a lot of classical music! So I know that this is more for Roman Catholic Homeschoolers, but yeah, a lot of Catholic homeschoolers (not all, a lot of my homeschool friends don't veil) wear mantillas. The Chronicles of Narnia is like the Lord of the Rings for younger kids. IF YOU HAVEN'T READ THEM YOU'RE NOT A TRUE HOMESCHOOLER. WHAT?? NO ONE TOLD ME THAT HOMESCHOOLERS HAVE REAL FRIENDS. Yeah, no. I have a lot of friends. 2. I have friends/come in close contact with "school-kids"
AND I'M STILL ALIVE. Yeah, I'm the only homeschooler in my orchestra, and then there's swim team, and dance. So I actually have seen a real "school-kid". I've been listening to it for about a year, BUT HEY. And not just Taylor Swift, BUT OTHER FAMOUS PEOPLES ALSO. Yeah, that thing about homeschoolers never leaving their house, listen to this: Monday, Tuesday, and Thursday we have to drive about 15 minutes to get to dance. Wednesday we drive 15 minutes to get to music and then later we drive about 25 minutes to get to orchestra. And then don't forget the Friday's we drive 40 minutes to get to organ. Right, I NEVER leave my house. That's right. I read, watch TV, write, do violin, go to dance. 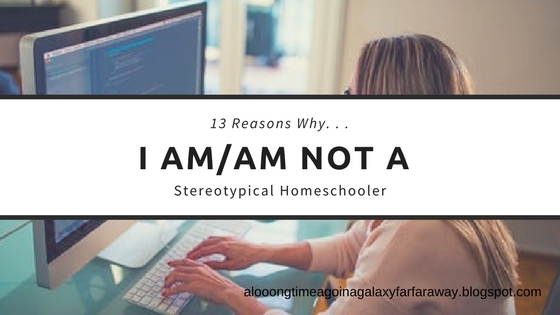 It seems like a lot of people think that homeschoolers find out that someone isn't homeschooled and goes, "OH MY GOSH??!?!?!??!?! ARE YOU STUPID???" And, y'all, a lot of this was sarcasm. OH YES. AMEN TO ALL THE ABOVE. I was technically homeschooled, as well as my brothers. I can relate to every single one of these. LOVEEE THIS POST!!!! SO TRUE!! EXACTLY. I love how Blimey Cow puts it. Something a long the lines of, "Wait, so you spend 8 hours in a classroom while I get up at 6 to get all my school-work done and then build a tire swing with the neighbors' kids (who are also homeschooled) yet I'm the one with no life??" How did I not find your blog before today?! I'm just in shock. I'm homeschooled too, although technically I'm already finished with high school. But that's not unusual for homeschoolers, I think. Can't wait to read more!